I popped out for a breather this afternoon, having had rather a busy day in the office thus far; which wasn't supposed to be in the contract but there you go. I suppose it's good to be busy in this day and age and in the current climate. Anyway, like I said, I went off for a walk to get some fresh air, with my legs taking me a route around neighbouring Clerkenwell. And I was just wandering around aimlessly really, head in the clouds, occasionally perusing some menus in windows and whatnot. When I found myself shuffling down Exmouth Market. Given the time of day (I popped out around 4) some cafes were shutting up and some restaurants were simply lulling around in that post-lunchtime, pre-dinner daze; with the occasional punter or two inside, lingering mischievously together over half a wine glass. Nothing much was happening. And then I looked over and saw that Clarks, my favourite pie and mash shop, was all shut up. Which didn't seem odd at first but then I noticed some hastily scribbled posters stuck up, advertising that you can still get pie and mash down the road in Kings Square, just off Goswell Road. "Still get pie and mash," I thought to myself. I went in closer, to peer through the slats in the corrugated shutters and spotted a sad, yet all too familiar bundle of dusty envelopes on the floor. Suddenly, a blast went off in my ears, followed by a gust of stale tobacco and alcohol. Turning around to find a pair of wide, dirty eyes staring and toothless mouth gabbling inches away, I was quickly informed, in scatter gun style, that Clarks had shut for good. And then he was off, jumping down the road like an animated scarecrow, chasing imaginary pigeons; leaving me to wipe my face clean. And then another person walked past. An elderly lady with black hair and silver roots, who may well have thought the look on my face mirrored some sort of grief at the loss of a treasured establishment. Because she stopped and put her hand on my shoulder and asked if I was alright, whilst sucking on a Magnum. Of course I was upset about what I had just heard. But I was grimacing mostly about the spittle. Once I recovered, I asked her how long it had been closed. "For about 10 weeks naah," she rattled back, licking on her lolly. Which seemed strange because I was sure it was only just last week when I visited, to get my regular fix of double pie and mash. But thinking on it some more, perhaps it was back in February. The reason for the forlorn shutters came about due to age apparently and not financial ruin, thankfully. The family that ran Clarks had simply run out of energy to keep going and got too long in the tooth. Funny, considering the ladies that served behind the wooden counter lost their teeth ages ago. But sad too, that there was no-one to take up the mantle and keep the business going; a business that according to my ice-cream loving friend had been passed down a couple of generations. I wasn't too sure about that but we stood for a little while longer and chatted about Clarks until she got down to the stick and left me with a smile that said everything will be alright. I hope it will be because I am going to miss Clarks. I am going to miss queueing up and miss ordering an aforementioned double; two flabby mince pies and two woolly scoops, smothered in green flecked sauce, on a cracked plate. I am going to miss grabbing a fork and a spoon and I am going to miss dousing the lot in vinegar and I am going to miss wolfing the lot in five minutes flat. Most of all, I am going to miss the smell. Pie and mash shops have a curious aroma that is hard to describe but to me, the scent is always warm, friendly and inviting and never fails to get the saliva glands going. Pavlovian conditioning, that's what it is. And memories, lots of nice memories. I will check out this other place but already, I've formed the opinion that it won't be any good. The gaudy, handwritten placards smack of opportunism, insensitivity and bad taste. Besides, you can't move on straight away and find someone new just like that. I'll give it a month or so at least. In the meantime, tonight, I think I might just pop over the road to the pub and raise a glass in memory of the once fantastic Clarks and all those wot sailed in her. A pint of beer only mind, no liquor or anything like that. I've got to work late tonight. I just stumbled into this article. 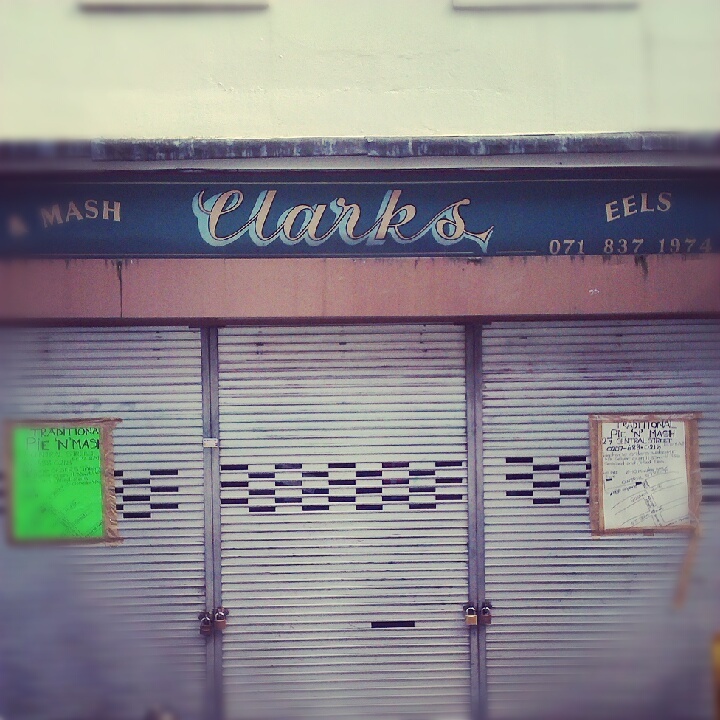 I similarly had a lunch time ramble last year and was disappointed to see Clarkes shut. Thanks for posting. I miss for the same reasons. I don't live in London any more but always went for my pie and mash at Clarke's when visiting the London Metropolitan Archives. I was "gutted" last year on finding it closed. Some wittering on eggs, poached or fried?